What The Hell Is Deathlok Wearing On Agents Of SHIELD? 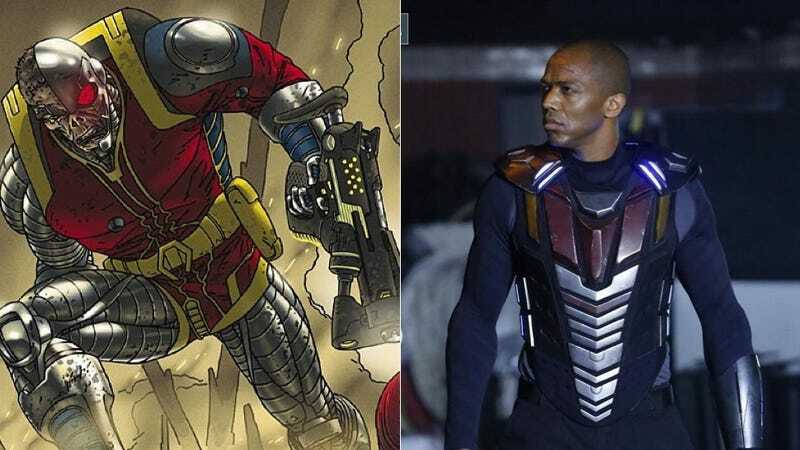 Can you spot six difference between the comics version of Marvel's undead cyborg assassin Deathlok on the left, and the TV incarnation of the character as he'll appear on on Agents of SHIELD on the right? Because I can spot several hundred. I'm actually not one of those guys that demands everything look exactly like the comics, and I full admit an accurate version of Deathlok's original outfit would look kind of insane on-screen. But what the hell is this? He looks like an evil bounty hunter from a cheap scifi show from the '70s. And what's with all the heroes needing giant arrows pointing at their crotches? I mean, Hawkeye can more or less get away with it, because arrows are kind of his thing, but jeez. Deathlok might at well have a giant blinking neon sign pointing to his junk.